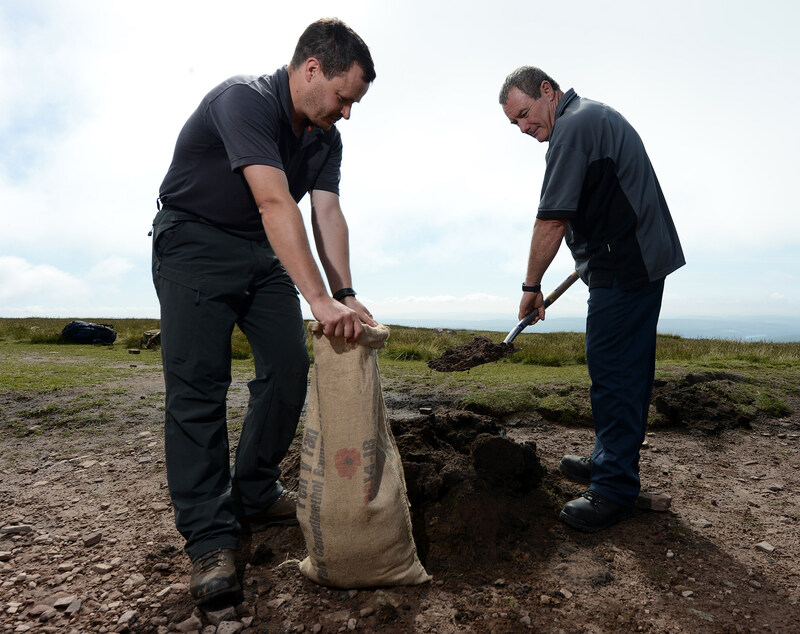 At a special service held earlier this morning (Thursday 17th July) soil from the top of Pen y Fan in the Brecon Beacons National Park – especially collected for an event to be held on Flanders Field on 16th August involving the unveiling of a Welsh Memorial to mark the those of Welsh descent who took part in the First World War – was blessed and carried down from the mountain. 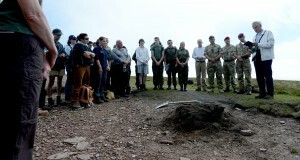 Soil from the top of Pen y Fan was today blessed by Reverend Richard Podger from the Parish of Cantref, who was joined by Colonel Kevin Davies, Deputy Commander from HQ 160 Brigade, along with officers from the National Trust in Wales, Brecon Beacons National Park Authority and members from the Welsh Memorial in Flanders Campaign Committee. Original reproductions of First World War sandbags – kindly donated by the Belgium company Mutoh in recognition for the event – have been used to collect soil from Wales’s two largest mountains, Snowdon and Pen y Fan, where it will be laid on Flanders Field at a ceremony on 16th August to mark all those of Welsh descent who took part in the First World War. Two Welsh schoolboys – one from North Wales and one from South Wales – will be speaking at the dedication service in Flanders, describing the two fallen Welsh soldiers, after which they will place the soil at the memorial base. The Flanders Field memorial has been four years in the making, and has been a labour of love for Peter Carter Jones, who is the leading co-ordinator of the Welsh Memorial in Flanders Campaign. A large specially commissioned bronze memorial dragon has been fitted to the top of the Cromlech, where it will be officially unveiled at a special memorial service by the Welsh First Minister and the Secretary of State for Wales. Nearly 20 representatives from across the Brecon Beacons National Park attended the small blessing event today to mark the beginning of the Welsh soils journey across the sea. The service of blessing was also attended by Robert Reith and Joe Daggart from National Trust in Wales; Cllr Geraint Hopkins, CEO John Cook, Julian Atkins and Jon Pimm from Brecon Beacons National Park Authority; Sue Brooke from the Parish of Cantref, 160 Wales Brigade, Paul Silk, member Welsh Memorial in Flanders Campaign, Lieutenant Colonel Jonah MacGill and Major Ian Gumm from 160 Wales Brigade and Major Bruce Radbourne from the Infantry Battleschool. 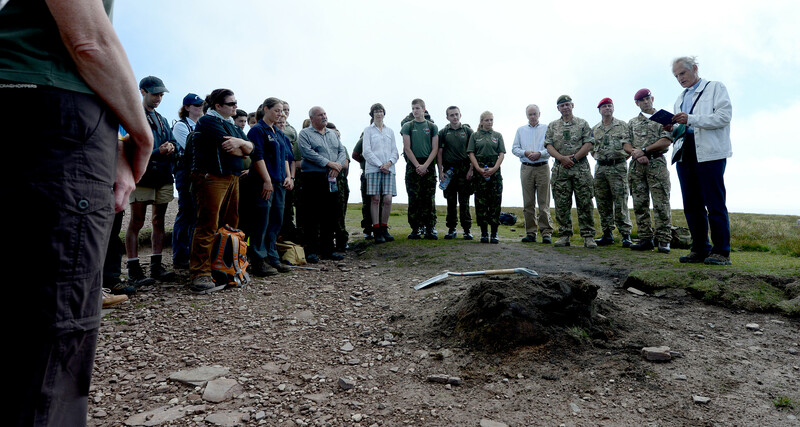 Speaking at the top of Pen y Fan, Colonel Kevin Davies said: “This is quite a special day for all of us and we stand here in honour of those who fell. The battles that were fought by our brave soldiers were the inspiration for me joining the army and being here for the blessing of this soil at the start of its journey across the sea in tribute to those who took part in the First World War is very special indeed.